This was our third visit to the Metropolitan Cooking And Entertainment Show in Washington DC. This is a short list of vendors that we visited this year. Our apologies to those folks that we have no pics of. 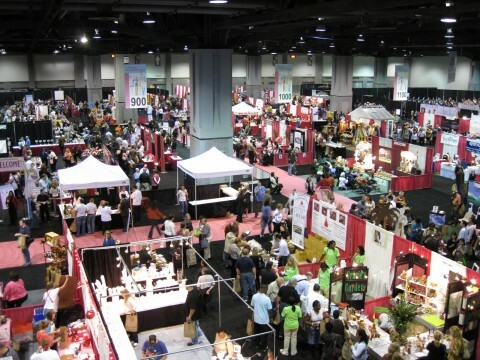 With literally hundreds of vendors, this show is growing bigger each year. And the best part is, there are more hot sauce, salsa and bbq purveyors than ever. Our first stop was at the booth of Michael Lampros, a certified Executive Chef and co-owner of Gunther’s Gourmet, based in Richmond, VA. He was offering over a dozen of his all-natural products for sampling, with an impressive range of flavors and heat ranging from Mild to Wild. The assortment of salsas, marinades and vinaigrettes not only kept the crowd coming back for more, but also garnered 10 awards at Zest Fest 2010! 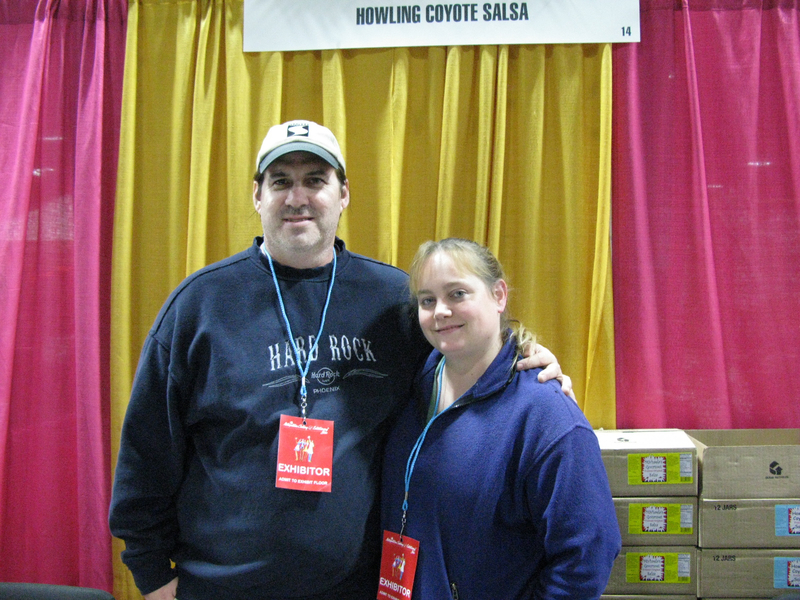 (We left his booth with a few of our favorites, including his Fiery Cranberry Habanero Salsa and Tomatillo Salsa Verde.) As a bonus, we had the pleasure of meeting Clement Bourg of www.cajunheat.com. His Voodoo Ash Cajun Seasoning won First Place in the 2009 Scovie Awards, and he graced us with a bottle of his hot sauce, Liquid Napalm (Thanks, Clement!) Awesome stuff! 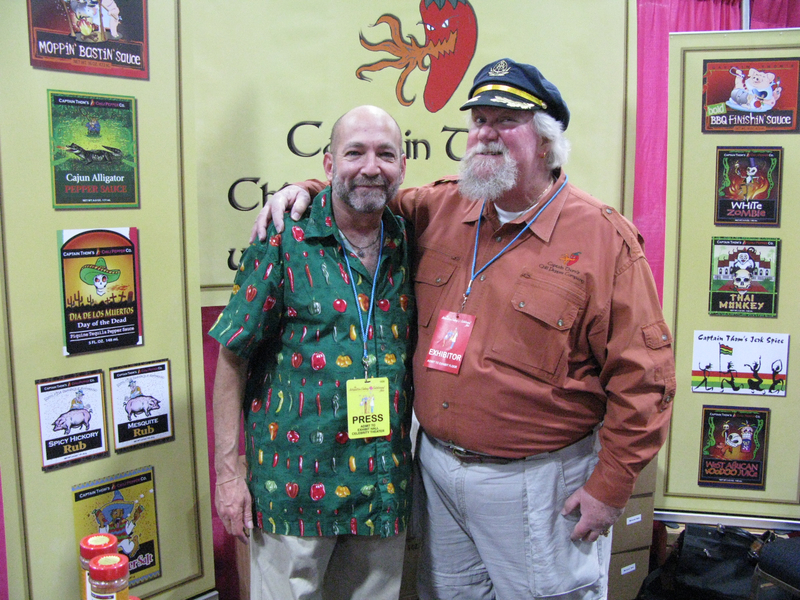 One of the more colorful characters at the show, and one of the nicest people in the industry, is Captain Thom. Located in Baltimore, MD, his unique offerings include Thai Monkey, Bite My Barnacles Wing Sauce, West African Voodoo Juice, and BBQ mopping and finishing sauces. Tons of spices, peppers, BBQ accessories and more are also available on his website, www.captainthoms.com. Thom is one of the most enthusiastic promoters of not only his products, but of anyone in the business. He introduced us to some folks we hadn’t met before..Thanks, Cap’n! Arghh!! 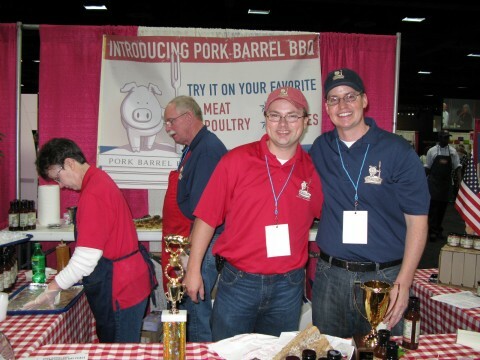 While listening to the US Senate debate Pork Barrel spending, Senate Staffers Heath Hall and Brett Thompson, both from Missouri, decided to join forces to create an amazing line of barbecue sauces and rubs called Pork Barrel BBQ. Since their launch in December 2008, not only have they won multiple awards, they also appeared on Shark Tank where they secured a backer. Now that’s impressive! The public response has been so postive that they’ll be opening their Pork Barrel Restaurant in the Spring of 2010 in Alexandria, VA. After sampling their rubs and sauces at the show, it’s easy to see why they’ve made their mark in the BBQ world. Their products are available in over 100 retail stores, including Harris Teeter and Bloom, and on their website. These guys are so down-to-earth and eager to share their love of barbecue that meeting and talking to them was a real pleasure. We’re looking forward to seeing them again, and if they have time, get them on for an interview during BBQ season for our podcast, HotSauceWeekly. Chef Eloy presented us with the only fresh salsa at the show, and it was a winner. His salsas, never cooked and kept refrigerated, are made with produce from local farmers when available, are a welcomed addition to the show. A former restauranteur, he and his wife decided to continue their tradition of bringing fresh tastes to the local market. His products are available in DC area Whole Foods stores, farmers markets, and can be purchased online as well . 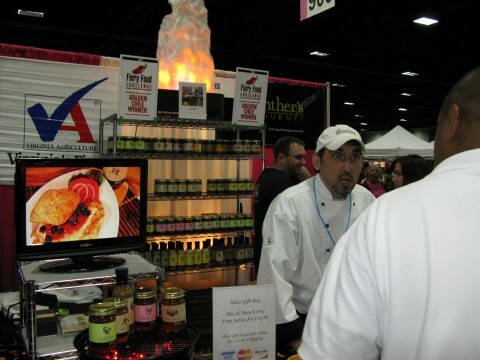 We really enjoyed the fresh flavors, and hope to see his products in our market area soon. 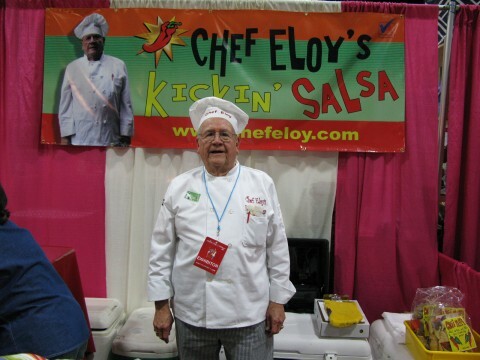 A really good, fresh salsa, not overpowered by onions or cilantro, is hard to find, but Chef Eloy has perfected the art! We met Randi-Kay and Gerry Metivier, a husband and wife team who are in the business for the long haul. Not only are they promoting themselves, but they’re lending a hand to the folks in their community! Turns out their Vermont community’s commercial kitchen is moving 2 hours away, so they have decided to open a commercial kitchen themselves, with a Vermont store in front, to give their foodie friends a place to produce and sell their products. Two lines of their salsas are named after their daughters: Michaela’s Gourmet Salsas (Famous Original, Honey Mustard, and Sweet Pickle) and Mariah’s Specialty Salsas (Vermont Maple, Strawberry Kiwi, and Sassy Apple). The third line, Howling Coyote Salsa, comes in Prairie Fire, Burning Cactus (yes, it was hot!) and Loco Diablo. Mariah’s Vermont Maple Salsa was voted Best Salsa of Vermont at the 2009 Champlain Valley Fair. You can find their products at www.VTsalsa.com. Take a look at this family-owned business, chosen as one of four companies nationwide to participate in AOL & Entrepreneur Magazine’s online reality series, “The Start-up” for Season One. A likable couple devoted to their family and community, we hope you’ll support them and check out their products. 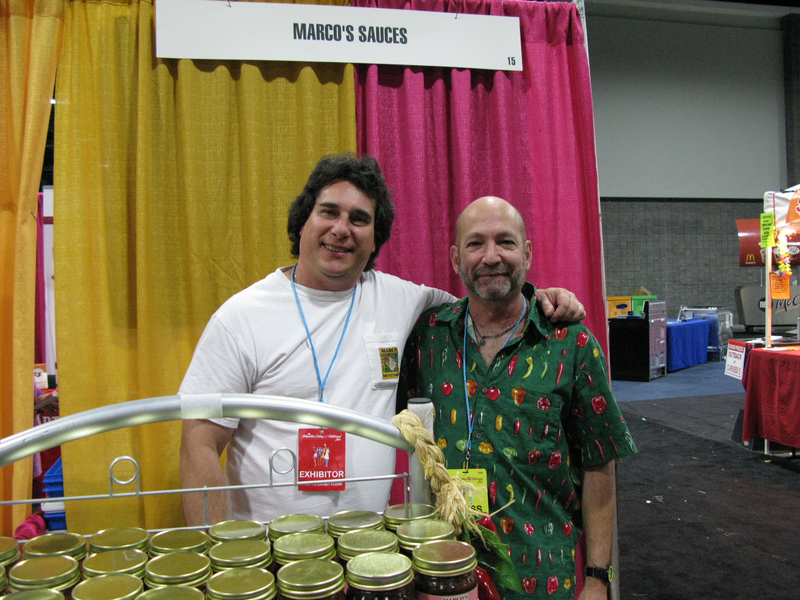 We first experienced Marco’s Not Yet Famous products when I was on a road trip to the Frederick, MD area. 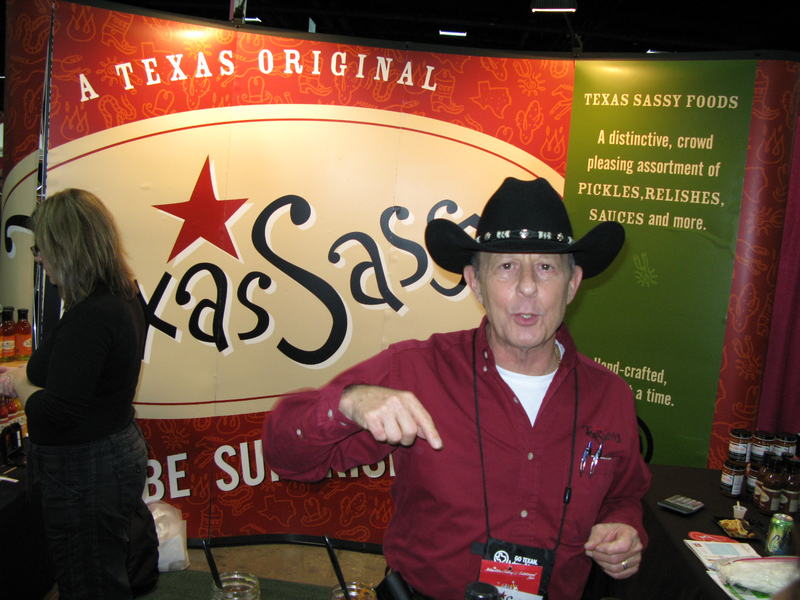 I found his salsas at M.O.M…. My Organic Market. Knowing that Marco’s products were local (he lives in Hagerstown and has a very successful restaurant there, Mr. D’s) I had to pick up a few bottles. After trying his products, we knew we had to meet the man. A winner of several Scovie Awards, it’s easy to see how not just the product, but the personality draws folks to him and make him the success he is. Being born Italian doesn’t hurt, either. I wish he had brought some of his restaurant offerings with him, because the Hot n Spicy Burger, stuffed with Carribean Red Habanero and spices, sounds amazing! And yes, that’s his mug on his bottles and jars! Wow, considering I was not able to go to the Weekend of Fire, I’ve got some great friends who were there and are sharing their experiences with us here. Here’s a slideshow of photos taken by Joey Ramone Combs (courtesy of his dad, Randy). Joey’s only 11 years old, but I think you’ll agree that he takes great photos! Thanks guys!